Opinion What will Trudeau do with the skunk in the room – Donald Trump – at the G7? At the G7 summit, which opens in Quebec on Friday, Donald Trump can contemplate a unique status among presidents at such gatherings: skunk in the room. The only exception may be G7 member Italy, which has just brought in a nationalist/populist government with antediluvian similarities to Washington’s. Mr. Trump’s former top strategist Steve Bannon has been in Italy observing the proceedings and keeping the Trumpians briefed. Though no longer an insider, Mr. Bannon has been pushing the President’s hot buttons. He believes that by pounding the nationalist drums and by selling himself as the last great hope of white hegemony, Mr. Trump will win the midterm elections in the fall. The unruly President appears to be buying in. Making a collision in Quebec all the more likely is that he has hardened his act of late. Not only has he pushed crippling steel and aluminum tariffs, but he has turned on his Ugly American switch in other respects. In lambasting undocumented immigrants, Mr. Trump said they “aren’t people, they’re animals.” He’s campaigning full bore for the Mexican wall again – and is again demanding that Mexico pay for it. His government is again reaching out to authoritarian leaders. His Secretary of State Mike Pompeo welcomed the foreign minister of Hungary to Washington, never mind the anti-Muslim and anti-Semitic bent of that government. As for his own authoritarian streak, Mr. Trump went so far as to declare this week that the state is him; that he has the power to pardon himself of all crimes. As he fulminates, G7 members, with Prime Minister Justin Trudeau in the chair, decide whether to confront him or to cower. 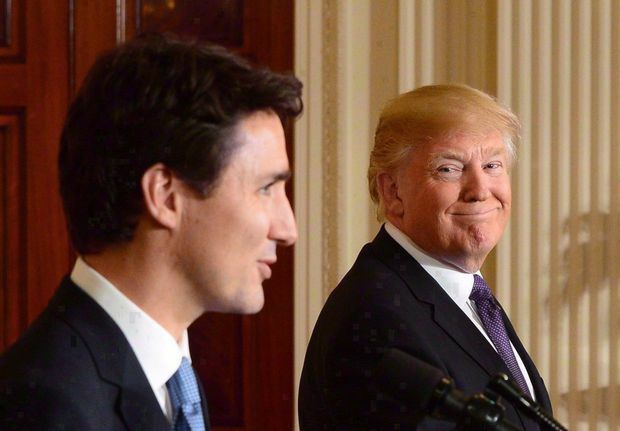 Prime Minister Justin Trudeau and U.S. President Donald Trump took part in a joint press conference at the White House last year. (File Photo). Coincidentally, the anniversary of the death of Robert F. Kennedy, 50 years to this day, is being commemorated. The syrupy reminisces on what he stood for, the antithesis of Mr. Trump, are pouring in. Campaigning for the Democratic nomination in 1968, Bobby Kennedy became the conscience of the country, its galvanizing spirit. More than anyone in the political galaxy, he projected deep caring and commitment – to the underprivileged, to ending the war in Southeast Asia, to healing racial discord. Bobby Kennedy was killed a few months after Martin Luther King Jr. and he is much remembered for his impromptu speech in Indiana, a plea to bridge the racial divide, on the same night of King’s death. Someone should pull Mr. Trump away from his TV set long enough to read that speech. Or perhaps, at the G7 summit, Mr. Trudeau should reference in his own words the ideals that Kennedy set out. It would be worth it just to watch Mr. Trump squirm in his seat, although, given his shamelessness, he would probably sneer instead. One of the only things G7 leaders will concur on with Mr. Trump is his push toward denuclearization in North Korea. No quick fix seems apparent. More likely, there will be protracted negotiations, which other presidents have unsuccessfully attempted. On other questions – on his tariffs, on his trashing the Iran nuclear accord, the Paris climate accord, on his fuelling of divisions, on his aversion to collective engagement – Mr. Trump will face a united front. But given the nature of these summits, more likely to come his way than hostility will be mild rebukes and diplomatic expressions of disappointment, which Mr. Trump will forget the moment he leaves the room. Mr. Trudeau, who can be credited with an inclusionary RFK vision, hopefully will be bolder. He was that way with his reaction to the tariffs last week and, having fruitlessly tried the other diplomatic route for so long with the President, was applauded for doing so. But if he is to represent how Canadians feel about this man and how so much of the civilized world feels about him, he needs to take it further. In an Angus Reid poll released this week, a sizable majority of Canadians said they see Mr. Trump as a bullying, corrupt liar. In the same poll, many rate Mr. Trudeau as feckless. They want more tough, less fluff. Now is Mr. Trudeau’s chance to show it. With the summit in his backyard, there’s no better opportunity. Among all the presidents that PMs have faced, there has never been greater reason.